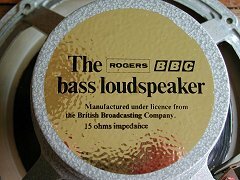 I get a lot of e-mail about all sorts of BBC and Rogers loudspeakers. This page summarises everything I know about models that haven't been mentioned elsewhere on this site - it's the culmination of lots of e-mail conversations and research, but please be aware that the information is not complete or totally accurate. I'm grateful to the numerous people who have helped me compile this information over the years, and I welcome corrections and further details from anyone with authoritative information. Finally, if anyone recognises their pictures and haven't received an appropriate credit for their inclusion, please let me know. I can be contacted at this page. The BBC's R&D department actively investigated loudspeaker technology for many decades, and there's no way I can do justice to that on this page. However, Harbeth's Alan Shaw has produced a history of the BBC's work with loudspeakers - definitely worth setting aside an hour to read it all. 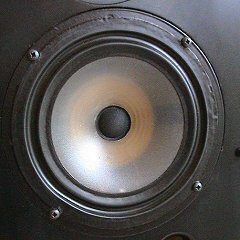 This article discusses BBC speakers, past and present. Click the thumbnails to enlarge them, or preferably read the OCR'd version. Please note: The copyright of this article belongs to the BBC, and while I believe that the inclusion here constitutes fair usage given the historical value, please be aware that it may be removed at any time. Since making those scans, I've learnt that all issues of this in-house publication have been made available on-line at the BBCeng.info site, and there are lots of fascinating articles to be found there. For example, issue 4 mentions the ongoing development work that would eventually produce the LS5/9, the launch of which is mentioned in issue 10. These models are related, but the exact relationships are quite hard to decipher. This e-mail from Allen Edelstein helps to clarify things. It was written during a discussion on the Spendor mailing list. 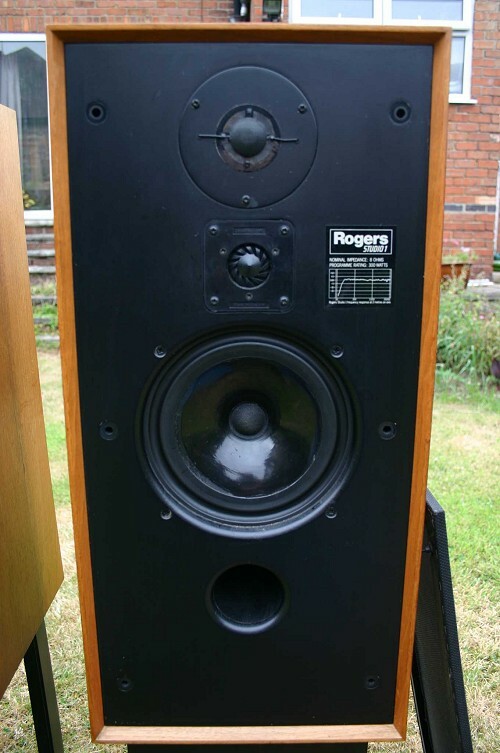 The Export Monitors were a mod of the LS3/6 by Rogers on their own to make the speaker a better home product. This was especially to increase the power handling which was low on the LS3/6 partially due to a light voice coil structure with a paper former. 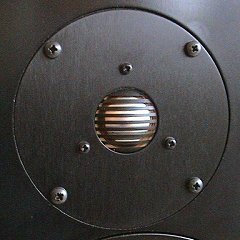 I recall (over 25 years ago) that the LS3/6 had the most beautiful, slightly lush midrange of any speaker I had ever heard and I'm not sure if this still would not be true. The BC1 was a pre-derivative of the LS3/6, but not a BBC model. Spencer Hughes had worked on the 3 way LS5/5. The BBC thought they could use the 8 inch mid of the LS5/5 to make a 2 way smaller monitor and they started to work on it. They stopped mid-stream and Spencer used the research to develop the BC1 on his own. It was originally a 2 way with just an HF1300. The STC super tweeter was added later. Meanwhile the BBC started the LS3/6 work again and finished it. 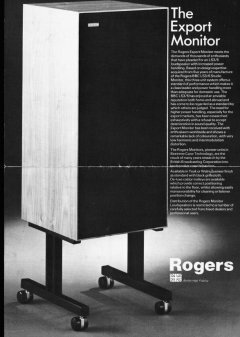 Rogers took on the manufacture and they proposed adding the HF2000 super tweeter which the BBC approved. Spencer Hughes was working as a lab technician on the development of the 12 inch drive unit that ended up in the LS5/5. Inspired by this experience, he developed an 8 inch Bextrene coned drive unit at home using an improvised setup, which, with the addition of a Celestion HF1300, became the BC1. This was done outside of the BBC, but he did offer the design to the BBC, as the terms of his employment required. 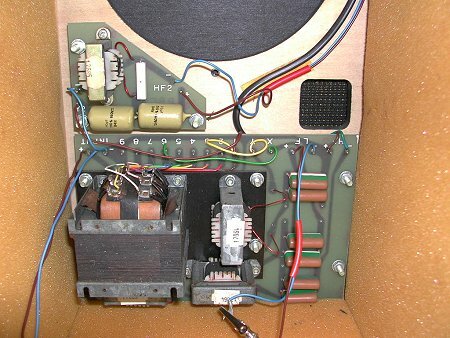 Initially, it was turned down because of the greater and greater sound pressure levels that were being demanded at the time, but subsequently, a need for such a unit did arise, and at this point, the BC1 design was adopted. 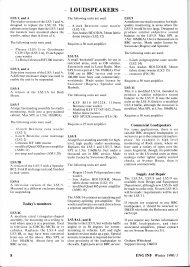 The BBC designated it LS3/6. 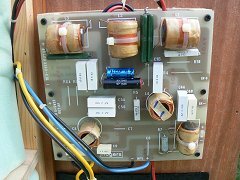 In the transition from the BC1 to the LS3/6, some changes were made - most obviously the addition of a large auto-transformer to allow the overall sensitivity of the unit to be adjusted. 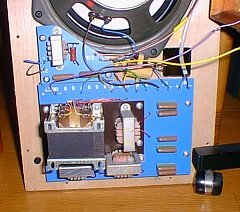 Some months later, the Coles 4001 super-tweeter was added to the BC1, turning it into the familiar 3-way unit that we know today. Meanwhile, and quite separately, the LS3/6 also morphed into a 3-way design; but this was at the suggestion of Rogers, who had been selected to manufacture the unit. 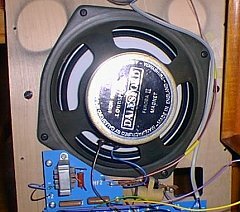 Rogers used the Celestion HF2000. 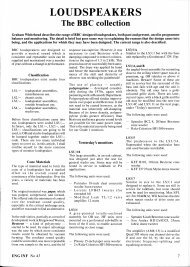 In 1975, having just got the company back on an even keel, it was decided to "sort out" the LS3/6. These had established a reputation, and there was a steady (if gentle) demand for them, but they had a lot of problems - reliability and manufacturing cost being among them. A bass driver was commissioned from Yorkshire company Dalesford which increased the power handling somewhat, and the required specification of the HF1300 was changed to greatly reduce the rejection rate. The model was very successful. Note the unusual grille cloth colour - this is original, but it's certainly different to the usual black that Rogers usually employed. Like earlier BC1s, but unlike the Export Monitor, this grille is fixed from behind the baffle. Here is a picture of the rear label. The low power rating is futher confirmation that this is an LS3/6. 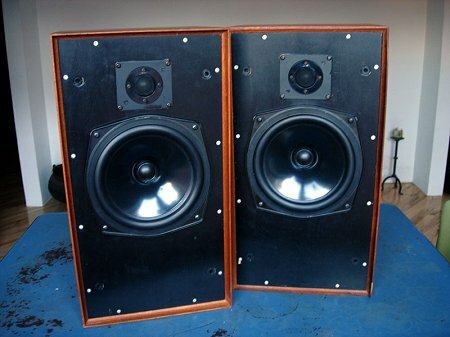 Here are two views of the woofers, which unfortunately were faulty. I believe they were going to be serviced, but I don't recall hearing an update on that. And this is a close-up of the crossover - as you can see, it's a serious piece of engineering! Those large inductors must have been incredibly expensive, not to mention heavy! The largest is an autotransformer, as mentioned above. The smaller units look like conventional inductors. The triangular PCB is for the super-tweeter, and appears to be an afterthought - because that's exactly what it was! In 2011, the LS3/6 was re-launched by Stirling Broadcast. The design work for this was done by Derek Hughes, son of Spencer and Dorothy Hughes - and who today would be better-placed to do this? These are my default loudspeakers today - I can confirm that they are rather special. 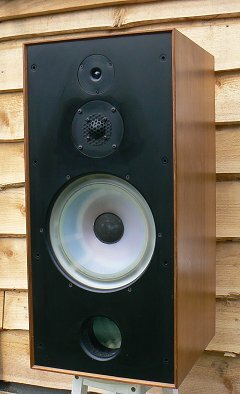 It's interesting to read that each Export Monitor is compared to a BBC LS3/6, confirming the link between these models. Chris also sent me these internal pictures of his early Export Monitors, which uses a crossover that looks identical to the BBC LS3/6. Given how expensive these must have been, I wonder if Rogers decided to use up stocks of components bought originally for the LS3/6? Or perhaps reusing the BBC design was just the quickest way to get the product to market? There are some extra components mounted off the crossover PCB - they are quite hard to see on these pictures, but look like an inductor and some capacitors, perhaps wired in parallel. 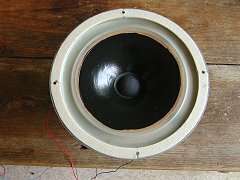 I'm guessing they are required because of differences between the original LS3/6 woofer and the Dalesford replacement. I was sent these pictures of a later export monitor with a seemingly unwell HF1300! Unfortunately, I haven't been able to track down the original e-mail, so please contact me if you recognise these images. As you can see, the crossover is quite different, and must have been much cheaper to manufacture - apparently this revision happened in spring 1977. This baffle appears to be made from birch ply, and although I'm not sure what the rest of the enclosure is made from, it's probably fair to assume that it's also birch ply. And this was almost certainly what the LS3/6 used, in accordance with standard "BBC thin-wall" practice. The internal walls are lined with bitumen damping and foam pads. As above, the bass driver is the Daleford unit, albeit with a Rogers label this time. 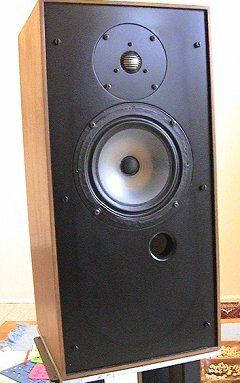 I confess to initally being confused by the super-tweeter, as it looks somewhat like a KEF T27 from the front, but nothing like one from behind. That's because, as mentioned above, it's actually a Celestion HF2000; remember, that's the tweeter that donated its grille to the T27 fitted to the LS3/5A! I'm grateful to Matthew Gregory for sending me details of his Export Monitors, which are quite different again. At first, I thought that they had been overhauled - albeit to a very high standard - but as they have been in his family all of their life, he was able to confirm that the only work to them was a pair of replacement woofers and latterly a crossover component upgrade which was done by Wilmslow Audio. The tweeter is now a KEF T27. The Studio 1 (below) uses the T27, and until this point, I had assumed that the T27 came in with this model change. Also, the bass reflex port has changed from a simple square hole to a more conventional round opening with a short cardboard tube behind. It is in the same place as the original square port, and I initially assumed that someone had retro-fitted this by drilling with a hole-saw where the square opening was - but it does look original. Because the port is larger, the crossover PCB has been rotated through 90 degrees. 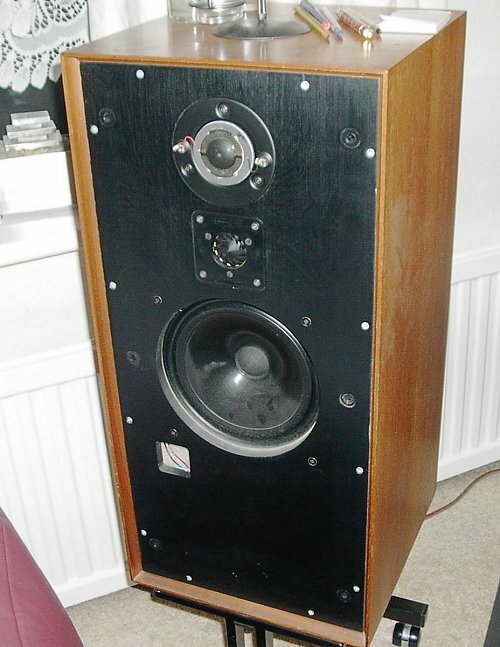 I was also sent a picture of one of the original bass drivers, and it looks very much like the original steel-framed Daleford unit, but there is no label on the rear of the mangnet. It is slightly different, in that the terminals are on opposite sides of the chassis, instead of emerging together on the same side. If anyone else has a set like this, or any information about these changes, I'd be very interested to hear from you. This is a development of the Export Monitor, and as you can see, the Studio 1 retains the large 3 way format. The bass driver is now made in-house by Rogers, and uses a diecast aluminium chassis. It continues to use bextrene for the cone material. The tweeter remains a Celestion HF1300, but the super-tweeter is now a KEF T27. Note how the bass driver is rear-mounted, with the opening rounded over to reduce diffraction effects. The two tweeters are flush-mounted for the same reason. The cabinet is made from critically damped 9mm MDF, which is cheaper than the birch ply used for earlier models. Another change is that the baffle is glued in place - though the rear panel is still held on with screws. Note the large round port with the short length of plastic pipe behind it - a quick and easy way to distinguish this model from most examples of the Export Monitor. In contrast to the earlier models, these have a much higher power rating of 200-300W. While I don't disbelieve this, it seems incredible when comparing the bass driver to that found in my ATC's. Click here for a review of the Studio 1. The Studio 1a is a more recent development, and at a glance appear to have more in common with the LS7 than the earlier Studio 1. They are a two-way design, using a clear polypropylene cone woofer and a dome tweeter. Click here to read the Studio 1a brochure, kindly submitted by Cliff Law. As you can see, they support "buy-wiring", as the market demanded at the time. The connectors are mounted directly onto the rear panel, rather than the thin plastic tray seen on the LS7 and others. The dimensions are the same as the Studio 1. 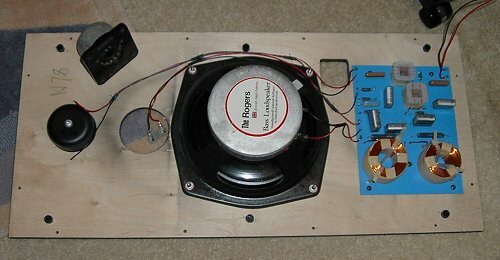 From the picture at least, the woofer looks identical to the unit used in the LS7t - does anyone know? The tweeter is a 34mm metal dome unit made by Celestion. I haven't had the chance to hear them myself, but Andrey says that compared to the LS7t, the "Studio [1a] has better sound in all respects". This large loudspeaker uses the bass and treble drivers from the BBC LS5/8, and adds a super-tweeter. Not much is known about this model, but I believe that it was in production between 1984 and 1986. I am indebted to Dave Callaghan for sending me these pictures of his pair, and allowing me to include them here. The loudspeaker measures 815mm high by 380mm wide, and 425mm deep. In old money, that's roughly 32 by 15 by 16¾ inches, which gives a volume of roughly 4.5 cubic feet. 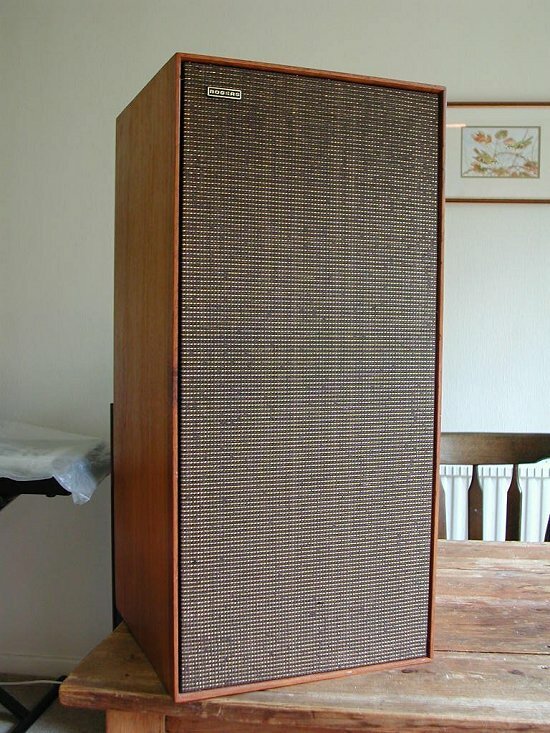 That's slightly less than the BBC LS5/8, which is around 5 cubic feet, and the proportions are rather different as well. The crossover is pretty complex - and although not visible here, there are additional components awkwardly mounted on the back of the PCB. 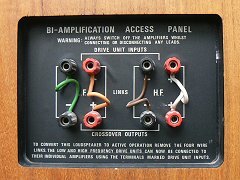 The post-crossover connections are brought out to the rear panel for active use; the idea being that a low-level crossover would feed two power amplifiers that in turn would directly power the drive units (although the crossover between tweeter and super-tweeter is still being done passively). Of course, the low-level crossover would have been unique to this system. I wonder how many Rogers sold? According to the label on the rear of the loudspeaker, the system has a power rating of an incredible 500 watts programme! Combined with a claimed sensitivity of 92dB/watt at 1 metre, these ought to be able to play fearsomely loudly! In really simplistic terms, 500 watts is 27dBW, meaning a single unit ought to produce peaks of 119dB SPL at 1 metre. Also according to the label, they are flat to within 2dB between 40Hz and 20kHz. This was a redesign of the Studio 1a by Andy Whittle in 1993. The enclosure and bass/mid driver were retained from the Studio 1a, but the metal-dome tweeter was replaced by a 25mm soft-dome unit from Scanspeak. The bass alignment was altered to produce a drier, less boomy sound in a typical domestic environment. 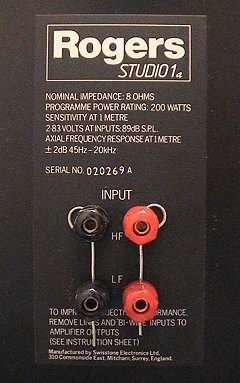 According to a review in the June 1993 issue of Hi-Fi News, the Studio 7 was much smoother and better balanced compared to the already high standard set by the 1a. Price then was £880 per pair. 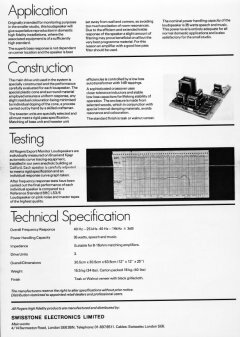 I was sent some pictures of the Compact Monitor a while back, but didn't know anything about them until I read Brian Pook's history of Rogers. Basically, they use a Bextrene-coned woofer from Dalesford in a scaled down sealed enclosure along with an Audax tweeter. I'm sure the Dalesford unit would be different to the one used in the Export Monitor, but they do look very similar from the front - just a slight difference in the dust cap. The LS6 was a popular model that existed in several versions. Sadly I haven't yet had the chance to examine or audition one yet, but I've been able to piece together some basic information about them. There are countless other models that have been produced by Rogers over the years, and I can't pretend to know about them. Basically, if there is nothing about them on this site, then I can't help you. The brochures on this page might help. 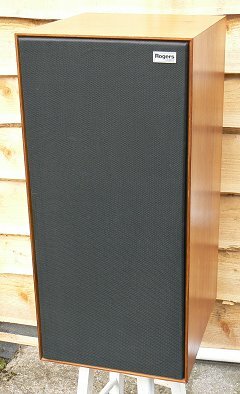 I do get a lot of e-mails about Rogers loudspeakers, but no, I'm afraid I can't tell you any more, and no, I've no idea what they might be worth! Please feel free to submit any info that you think might be useful here - I'll gladly post it here. Rogers have been owned by the Wo Kee Hong Group since around 1993. Interestingly, this old web address redirects to Auto Italia Holdings Limited, who appear to own many brands including Ferrari and Maserati, among many others. Back in 2008 they relaunched the LS3/5A using modern drive units. It retails for around £1500, and got a rave review from Ken Kessler in HiFi News. Martin Colloms was also very positive in his HIFICRITIC review. It's interesting to look around the Rogers website - you'll see a wide range of consumer electronics wearing the Rogers name, including AV receivers, DVD players and plasma screens! As of 2013, I notice that a lot of these have been discontinued, and their current product range appears to focus on just loudspeakers and amplifiers. They're making full use of the "British High-Fidelity" strap-line on the Rogers logo, but with the exception of the new LS3/5A, it looks like none of the products are designed, developed or built in Britain. Curiously, the "Reviews" section doesn't actually contain any reviews, but does have brief details of all the older models that Rogers made before they closed down the UK operation.